We’d love your help. Let us know what’s wrong with this preview of See You in the Piazza by Frances Mayes. To ask other readers questions about See You in the Piazza, please sign up. This is Mayes at her best. She takes us on a tour of Italy and little known places. They are places Mayes and her family have visited and enjoyed. It is chock full of travel tidbits, recipes and wonderful renditions of the sights and smells of Italy. It is not a book to be used to plan a trip and is not set up necessarily in geographical order. It's just places that Mayes has enjoyed. While I was reading this, I wanted to book a trip to Italy, rent a car and spend six months travelling around en This is Mayes at her best. She takes us on a tour of Italy and little known places. They are places Mayes and her family have visited and enjoyed. It is chock full of travel tidbits, recipes and wonderful renditions of the sights and smells of Italy. It is not a book to be used to plan a trip and is not set up necessarily in geographical order. It's just places that Mayes has enjoyed. While I was reading this, I wanted to book a trip to Italy, rent a car and spend six months travelling around enjoying the food and the ambience. This book is a wonderful introduction to Italy and can be savored for quite some time. I LOVE ITALY!!!! And until I can retire there in a few years, books like this help keep me sane. What a wonderful travelogue of SO many places in Italy, of the sights, the people, the FOOD! You can almost picture the scenes, the smells and the tastes. It's a long book, over 400 pages. The better to savor it slowly, reading one chapter at a time. The only complaint I have, (and as this is an advance reading copy, maybe it will be fixed in the final product? ), is that there were no photos. The add I LOVE ITALY!!!! And until I can retire there in a few years, books like this help keep me sane. The only complaint I have, (and as this is an advance reading copy, maybe it will be fixed in the final product? ), is that there were no photos. The addition of photos would make this a truly outstanding book! Mayes brings the rest of us along on her beautiful journey through Italy. Her descriptions the the scenery and food are incredibly realistic -- even if her travels are well out of realm of possibility for most of us. But that is the glory of reading travelogues! Free travel without restrictions. If you can get past the immense privilege on display in Mayes' love for expensive sit-down restaurants and plush lodgings, then yes, you will be charmed and transported by the descriptions of food, history, and Italian life. Better read one section at a time, rather than straight through -- as you would a guidebook -- SEE YOU IN THE PIAZZA would be a much more pleasurable reading experience if it contained photos, maps, drawings, and other visual support for her travels. Mayes brings her delectable writing style to the pages of this travelogue/memoir/guide for all of us who wish we could take two weeks to walk in her shoes. Italy isn't just a place but an attitude and way of living, something Mayes makes clear through gently describing the distinctions between one little town and another. This is not a book you pick up with your map in hand to help you plan your trip to Italy so much as it is like a first date (or first date in a long time) with the Italian way to spend your day. Yes, she has the book organized in such a way that you could look up the province and town you want to visit to see her recommendations. However, she doesn't cover every little town (nor should she, as this isn't Frommer's) and she presents them in a well-organized tapestry of anecdotes of her experiences there. Mayes implies so much about what it means to be Italian and live like one without having to hold your hand to communicate it. I am a huge fan of Frances Mayes. The first time I read Under The Tuscan Sun I knew it was, for me, a life changing book, and I was right. I fell in love with all things Italian because of her words and descriptions; I could taste the food she described and the scents she smelled; could visualize the details of her house and her travels. I’ve read every book she’s written since then, and was so excited to receive an ARC of her newest book on travel in Italy, See You In The Piazza. I could never b I am a huge fan of Frances Mayes. The first time I read Under The Tuscan Sun I knew it was, for me, a life changing book, and I was right. I fell in love with all things Italian because of her words and descriptions; I could taste the food she described and the scents she smelled; could visualize the details of her house and her travels. I’ve read every book she’s written since then, and was so excited to receive an ARC of her newest book on travel in Italy, See You In The Piazza. **I cannot wait for this book to come out so all the people I have told about it can read it. Frances Mayes has a special talent. Yes, obviously she is an author of wonderful books. Not all authors however have the ability to describe things in such a way that literally slows down your reading...Why? Frances Mayes draws you in and plunks you down in the piazza with her. The reading slows because you are no longer seeing words on a page but are tasting the food, smelling the smells, hearing the so **I cannot wait for this book to come out so all the people I have told about it can read it. I would recommend this depending on what the reader is looking for. This book contains information on various places in Italy that Mayes and her family have visited. This is more travelogue but not really a travel guide as one might expect. The book will give the reader ideas of places to visit if they are planning a trip to Italy but there is plenty here for the armchair traveler as well. Recipes are also included among the entries so the reader can get a real taste of Italy as well. If the rea I would recommend this depending on what the reader is looking for. This book contains information on various places in Italy that Mayes and her family have visited. This is more travelogue but not really a travel guide as one might expect. The book will give the reader ideas of places to visit if they are planning a trip to Italy but there is plenty here for the armchair traveler as well. Recipes are also included among the entries so the reader can get a real taste of Italy as well. If the reader is looking for a standard memoir, this isn't it. I did find myself wishing there were photos. Frances Mayes is a wonderful author! She has brought us another unique book. This one sends us with her and her family and friends exploring each unique area of Italy. Along with each beautiful description and experience she give us a mouthwatering recipe. As always, I feel like I’m right there with her. If you really want to learn about and experience Italy, don’t reach for a travel guide. Instead join Frances on her journey through the country with this book. You’ll love it! Richard Saul Wurman wrote the Access Travel Series from the late Seventies to about 1998. These books offered a quirky view of the locations they covered, filled with suggestions from local residents, and entries about unusual stores and sites that are ignored by most other travel guides. I loved traveling with those guides, which always left me feeling like I had experienced some of the actual culture of a place, not just the cultural or historic sites that are highlighted in most travel guides Richard Saul Wurman wrote the Access Travel Series from the late Seventies to about 1998. These books offered a quirky view of the locations they covered, filled with suggestions from local residents, and entries about unusual stores and sites that are ignored by most other travel guides. I loved traveling with those guides, which always left me feeling like I had experienced some of the actual culture of a place, not just the cultural or historic sites that are highlighted in most travel guides. To this day, whenever I am preparing for a trip to someplace new, I always search for a guide that offers a similar insight to my destination. See You in the Piazza, although not really a travel guide in the same sense, reminded me of the Access books. Mayes recounts her travels to a variety of locations throughout Italy. She is an excellent writer, with a simple descriptive ability that is truly evocative; probably a result of her work as a poet. I most appreciate her observations about what made each town she visits so unique, highlighting what makes it completely different from another town not five miles away. She seems to suggest that this is a specific characteristic of Italy, but I am not convinced; I think it might be as much about her attention to detail and genuine curiosity about a place as anything specific to Italy itself. I did have a few quibbles however. I remember having a discussion with a friend when Under the Tuscan Sun was first released. She was uncomfortable with the author’s unacknowledged wealth in that book. The freedom to travel back and forth to Italy and the money spent on renovating Bramasole was far beyond the reach of the average reader, and that it was never acknowledged troubled my friend. That issue is definitely still at play in this book. I am guessing, but I believe the average reader might be astonished by the cost to follow even one of the itineraries described by Mayes in this book. My other complaint may be a result of my reading a pre-publication copy of the book. I wish there had been a map at the beginning of each regional section, showing the area of Italy and the locations of each town she visited. My geographic knowledge of the country is minimal, and I found myself having to look up each location in order to understand exactly what part of the country she was visiting. Many of the towns she names are small enough that maps showed only a small area around the town, and when I would try and scroll out on the map, the town would disappear. Regardless, I found this book a wonderful, evocative read. It made me fantasize about finding my passport and booking a plane trip immediately. A wonderful companion to have while traveling through Italy. Yes, it’s a travel book, but it reads like a journal. Italy has been portrayed in so many ways in books, this book just brings it to life even more. Frances Mayes describes the places as if you’re experiencing them with her. It makes me desire to go there! Enjoyable and beautiful! I thought this was going to be more of a novel. Instead it was a guide to Italy and many of the wonderful places to visit. This would be a good book for those planning a trip to Italy. I would like to thank Netgalley and the publisher for providing me with a review copy. This is my honest and unbiased review of this book. Italophiles rejoice a new travel book is here to help you find even more to love about Italia. Frances Mayes really brings the small towns to life and makes your stomach rumble with advice on what to see and what to eat you can't go wrong. I read for a honest review for Crown Publishing.I have read Ms.Mayes book Under The Tuscan Sun ,beautiful written like your right there, just like See You in the Piazza. You can almost smell the lasagna coming out of the oven.I would love to visit Italy one day and this is a handy guide. From the publisher, as I do not regurgitate the contents or story of books in reviews, I let them do it! The Roman Forum, the Leaning Tower, the Piazza San Marco: these are the sights synonymous I received a DIGITAL Advance Reader Copy of this book from #NetGalley in exchange for an honest review. The Roman Forum, the Leaning Tower, the Piazza San Marco: these are the sights synonymous with Italy. But such landmarks only scratch the surface of this magical country's offerings. In See You in the Piazza, Frances Mayes introduces us to Italy only the locals know, as she and her husband, Ed, eat and drink their way through all twenty regions--from Friuli to Calabria. Along the way, she seeks out the cultural and historic gems not found in traditional guidebooks. Tuscany was always a bucket list trip for me until it became a tourist mecca because of this author: I wanted to go to quieter places and maybe I can get there before they are over-run as a result of this excellent book. Mayes gives us a wonderful place to visit and recipes to make to remind you of these places BUT I WANT PHOTOS. TONNES OF PHOTOS ... especially of the finished recipes. This is a 400+ page book and there are no photos beyond the main cover. (maybe there are in the actual physical book? I don't know but I DO KNOW that I do not want to google each place and look for photos to see if it intrigues me. The recipes look yummy: I actually made the Lemon-ricotta torte for Canadian Thanksgiving today - I added rosemary as we didn't want it too sweet and the test sample (made in an InstantPot™!!) was amazing. If you are an armchair traveler as I am and you love reading about Italy, get this book immediately! I certainly loved Under the Tuscan Sun as well as Mayes' next book Bella Tuscany. This one won't disappoint if you are fans of Frances Mayes and like a foodie/cultural narrative. See You in the Piazza isn't a novel. I'd describe it as a cross between a memoir and a travel guide, yet it isn't specifically either one. It's the sort of Ex-Pat lit that I can sink my teeth into, traveling vicariously t If you are an armchair traveler as I am and you love reading about Italy, get this book immediately! I certainly loved Under the Tuscan Sun as well as Mayes' next book Bella Tuscany. This one won't disappoint if you are fans of Frances Mayes and like a foodie/cultural narrative. See You in the Piazza isn't a novel. I'd describe it as a cross between a memoir and a travel guide, yet it isn't specifically either one. It's the sort of Ex-Pat lit that I can sink my teeth into, traveling vicariously through descriptive writing. Our author has traveled extensively throughout Italy enjoying the foods, culture and atmosphere, eventually purchasing a second home in Tuscany. Yet Ms. Mayes says she feels the same excitement as she did her first few years of living in Italy. "To know Italy would take ten lifetimes." It's a foodie book for sure - Olive trees, Negroni, homemade pasta, seafood, fresh fruits and vegetables, recipes and more. The book is set up geographically from north to south. It doesn't have to be read cover to cover, rather you may choose the county of interest. This will stay on my Kindle as a reference guide in case I'm ever able to visit Italy. Read this and you will want to pack up and move, enjoy a different culture and pace. This book was published March 12, 2019 so hustle to your favorite bookstore or online retailer and immerse yourself with Frances Mayes' Italian travels. Sharing with Heather for her March Foodies Read series. 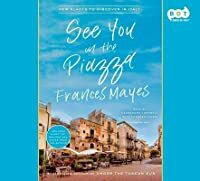 "See You in the Piazza" by Frances Mayes, is a must-read before you head to Italy, and a lovely reminiscent read if you have already been! I’ve been to Italy 7 times and that’s nothing compared to Mayes vast experience with this beautiful and quirky country that “calls to me” as it obviously does to her. "The most vivid pleasures of Italy are the simple ones.” This is so true and you should approach any trip to Italy – whether to the big cities or to the countryside – in this way. Mayes beautiful "See You in the Piazza" by Frances Mayes, is a must-read before you head to Italy, and a lovely reminiscent read if you have already been! I’ve been to Italy 7 times and that’s nothing compared to Mayes vast experience with this beautiful and quirky country that “calls to me” as it obviously does to her. Just to name a few! And the food! Not only has Mayes described tantalizing mouth-watering dishes to enjoy – she has included recipes! Doesn’t that sound perfectly lovely – and exciting?! The book is arranged by region from north to south and you can read it in any order. I started with the Toscana section because that’s where I’m going nest. Then I read sections about where I’ve been before to see what I hit and what I missed there. Clearly I will now need to go back to those places as well. Mayes style is elegantly descriptive, yet conversational, and her stories and anecdotes are little gems. Who could read this and not want to go with her and her husband on their next Italian adventure! I do! In this book, Frances Mayes explores the hidden gems of Italy. I enjoyed imagining these places and the recipes included in the book, but I thought it needed photos and other visuals to make it more robust. Thank you to NetGalley and the publisher for an advanced reader’s copy of this book in exchange for an honest review. Really 3.5 stars only because it was a little choppy to read. This was kind of an "Italy Off the Beaten Path" and gave me insight and desire to visit the smaller, less touristy towns and regions. THe food all sounds delicious! Frances Mayes's new book is See You in the Piazza: New Places to Discover in Italy published by Crown. Her most recent novel is Women in Sunlight, published by Crown and available in paperback in spring 2019. With her husband, Edward Mayes she recently published The Tuscan Sun Cookbook. Every Day in Tuscany is the third volume in her bestselling Tuscany memoir series. In addition to her Frances Mayes's new book is See You in the Piazza: New Places to Discover in Italy published by Crown. Her most recent novel is Women in Sunlight, published by Crown and available in paperback in spring 2019. With her husband, Edward Mayes she recently published The Tuscan Sun Cookbook. Every Day in Tuscany is the third volume in her bestselling Tuscany memoir series.